← Moving to Mexico: FMM, FM2, FM3, or Inmigrado? 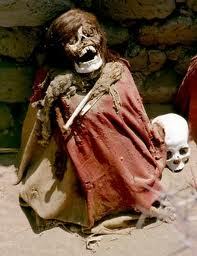 to Peru where some families bring out the mummy to sit and eat with the family. In Mexico, ex-pats often wonder what the 3 days of Dia de Los Muertos are about. Here’s a fun video short that gives some insights into central Mexico’s views on the dead. Enjoy, and maybe hoist one in honor of your ancestors and those who helped make you who you are. Yes, the ways of dealing with the passing of family members are truly varied, and some times seem bizarre, across cultures. There’s a thesis waiting to be written on what birth, wedding, and death rites say about societies and groups. I know that my family viewed other cultures’ death rites and ceremonies with a mix of curiosity and criticism, while they were unable to see their own practices with much clarity. Me? I hope to find an isolated but pleasant spot in the woods, commune with nature and friends, and make the journey with minimal fuss.